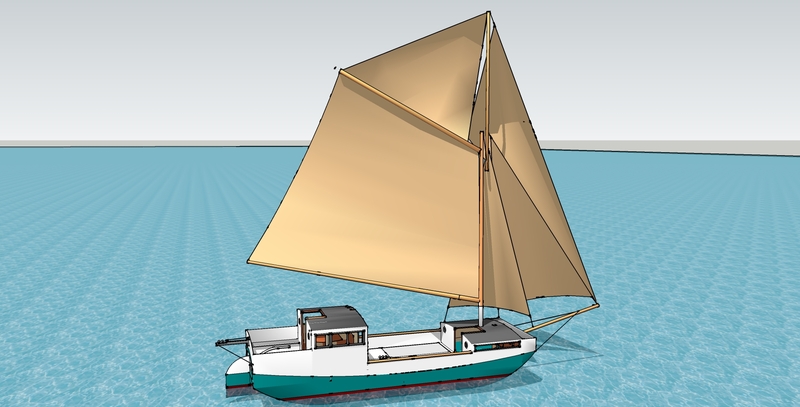 While the traditional Chinese junk rig is still our main contender for ease of handling and jibing when running before the wind on inland rivers, the traditional rig for these waters is another possibility. When I was at the Rockport Apprenticeshop (a school of wooden boatbuilding) as a volunteer in 1991, I remember sailing for a few days in a Friendship sloop built by the school that sported a similar rig. It’s a pretty suspensful climb to the topmast when out on the open ocean–that memory has sure stayed with me. And there is something incredibly gratifying about the Friendship sloop’s lines and rig. This rig gives the cargo boat a much more traditional “American” look, but the handling considerations may rule it out in in favor of the more user-friendly junk rig. I haven’t ruled anything out at this point. Being a workboat, practical considerations will probably trump aesthetic ones. I’m willing to bet that junk rig won’t point anywhere near as high as that sloop cutter .and in light winds the topsail and ability to hoist a varying amount of sail combinations will pay off greatly on your intended route. If the junk rig performed better ,the sailors would probably aready been using them on the hudson. The high aspect ratio slopp/cutter topsail is quite common on inland waters and has proven effective. After a second look I think “gaff rig w/ topsail’ would be a more accurate description of the traditional rig used. The correct name for the rig you show here is a Sprit (pronounced Spreet) Rig. The sprit is the spar from the lower forward corner (tack) of the mainsail to the top aft corner (head) whereas a gaff runs from the top forwarsd corner (throat) to the head. This rig was used extensively by sailing barges working the East Coast of England and the English Channel in the 19th and early 20th centuries, but their demise wasensured by the advent of the diesel motor barge. The key advantage of the rig is that the sails do not come down on deck when stowed, but, in the case of the main and mizzen (small sail on the aft mast) are brailed up, leaving the decks clear for handling cargo. The topsail, once dropped down the topmast, is lashed to the top of the starboard shrouds – also clear of the deck. The topsail, at least on larger versions of the rig, gives the necessary drive when sailing near tall dockside buildings which will blanket the main, mizzen and foresails. The mizzen itself adds little power to the rig, but was generally sheeted to the rudder so that it was hauled up to windward when coming about, helping to push the stern round. It is also customary when tacking (winding in bargeman’s language) to back the foresail to push the bow round. A long box is not the handiest of craft to manouvre under sail! For those more interested, it costs just a few pounds a year (?20 dollars US) to join the Trust. as a member you csan go sailing on either of the trusts two barges when you visit England.